Mary, Queen of Peace Catholic School believes in the one Lord Jesus Christ and the Church He established, and enlivens that belief by promoting the formation of each student spiritually, academically, physically, and socially through a challenging curriculum, in a nurturing environment, with an emphasis on service to this same Lord, this same Church, and the local community. Our crest contains four symbols, which are united by the cross of Christ, as Jesus is central to our school, our homes and our lives. The fleur de lis is a special emblem of the Blessed Mother and the three petals of the flower also represent the Holy Trinity. The scroll indicates knowledge, both of academics and of our Catholic Faith. The Holy Spirit, the dove, inspires us to live in love and peace. 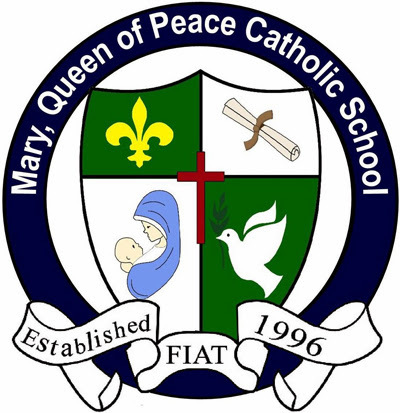 The Mother and Child is our school’s namesake, Mary, Queen of Peace. This image depicts a loving, nurturing mother, the model for our school. Below the crest is the word “Fiat,” or “Let it be done.” This is Mary’s response to the angel Gabriel when told she would bear God’s son: “Behold, I am the handmaid of the Lord. May it be done to me according to your word” (Luke 1:38). Mary said “yes” to God’s gift of His Son, just as we aspire to say “yes” to God’s gifts to us.